B2B brands’ marketing departments are constantly evolving. Over the past 10 years, marketing teams have undergone a seismic shift to accommodate changing technology, millennial consumers and employees, and to breakdown silos between marketing and the rest of the business. To keep pace with the changing marketplace, many B2B brands are working to find the perfect balance between growing out their in-house digital marketing team and partnering with an external digital marketing agency. Most brands are seeking agency partners to provide a spectrum of services, from tactical support to creative strategy and content innovation. And they need a partner that can adapt and evolve along with their marketing needs and opportunities. So, the question is: To find that partner that can grow and adapt to your needs, what should you be looking for? In our humble opinion, the best brand/agency partnerships help brands stay ahead of their competitors with integrated strategies, an eye on the latest and greatest, and the ability to measure and iterate on the success of campaigns. Here are some key characteristics that you should be on the lookout for. Along with prioritizing the relationship, the right agency partner will build trust with your brand by offering transparency, which comes to everything from contract deliverables to the results of your core KPIs. If you are partnering with an agency to help you test emerging trends; it’s especially critical that a great partner share what is and is not working, so your teams can together optimize and iterate. Whether it’s a change in timeline, a tweak to a tactical mix or an honest assessment of how you’re tracking against benchmarks, a good partner will drive straight forward conversations that help you move forward in the best way. In B2B it can be especially tough to get up to speed on a new vertical or product. Tapping into an agency that has a similar client base to you; speeds the learning curve as much as possible. Industry trends (like IOT for example) often span verticals; so look for a partner that understands the lingo, but also has an existing network of influencer and contacts. 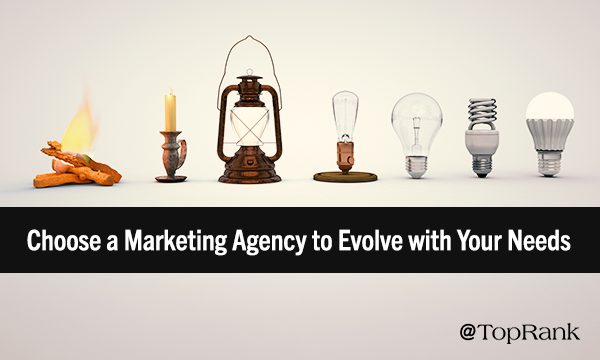 The agency place within your marketing department will continue to evolve as your team does. And partnering with right agency can provide you with a partner who will help you innovate tactically and strategically, while providing your in house team with the support they need to reach their goals in 2019 and beyond. What do you look for in a great agency partnership? Tell us in the comments section below. We’re fortunate enough to have built client relationships that stand the test of time. For many, we engage in an always-on approach to digital marketing, allowing us to capitalize on opportunities and tackle challenges. Get a small glimpse into what an ongoing partnership looks like by learning how we were able to make small tweaks to yield big results for one client in a niche B2B industry.